"I'm schvitzing!" a girl cries. "I don't know why I'm standing here-I'm gluten free!" another says to her friends. These are just two things that I hear while standing in line for Brooklyn Boy Bagels. 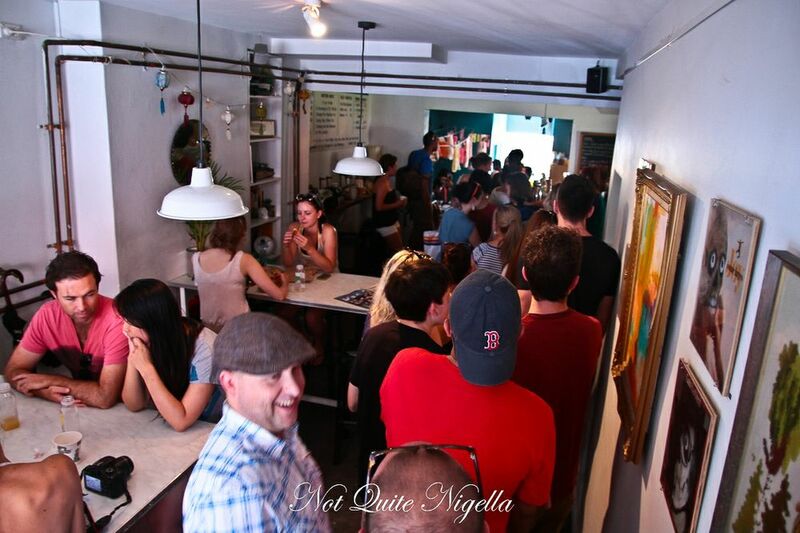 It's the first day of this four day pop up bagel store set to open for four Sundays during February and March at Darlie Laundromatic and the crowd snakes up the street and around into the laneway. A Ferrari growls down the laneway and owner slows to ask us what the whole commotion is-after all a queue outside an eatery is normal-ish but a queue outside a laundromat less so. We tell the driver that it's a queue for bagels and he drives away looking about as perplexed as he was when he first asked. We joined the queue at 10:30am and there are whispers that they've run out of plain cream cheese for the bagels an hour in. We notice that the queue is made up of an assortment of many American accents, the guys in front of us are from Boston and Brooklyn and it seems like a lot of them heard about this on the Meetup.com message boards. "The American community talks" one of them says. He was planning on buying a dozen bagels but seeing the queue, thinks that he may to revise his order. A man exiting the store is biting into an "everything" bagel and I notice him because well, he looks ludicrously happy. "Are they good?" we ask him and he smiles and swallows. "They've done it, it's a real bagel" he says in what has to be the most compelling plug we have for our reason to queue. 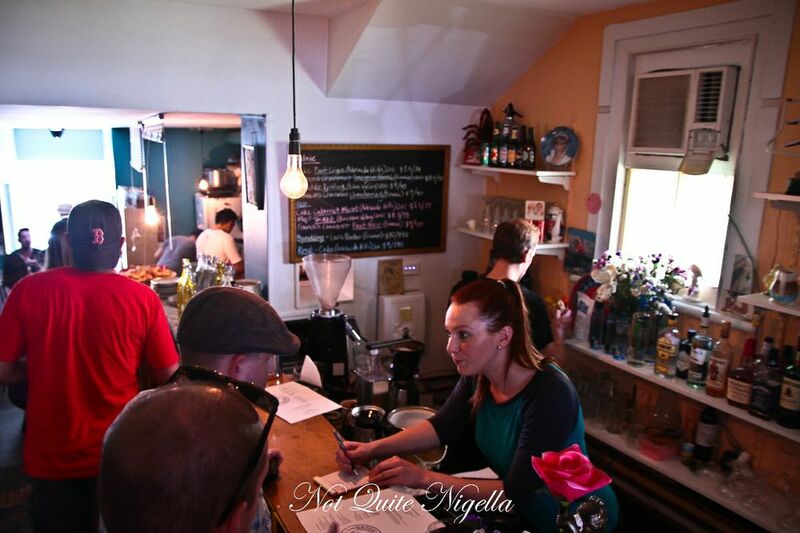 A menu is passed down in the queue and we take a look. Bagels here are $4 each for an unadorned bagel. This is of course more expensive than the 80c versions hawked in New York. 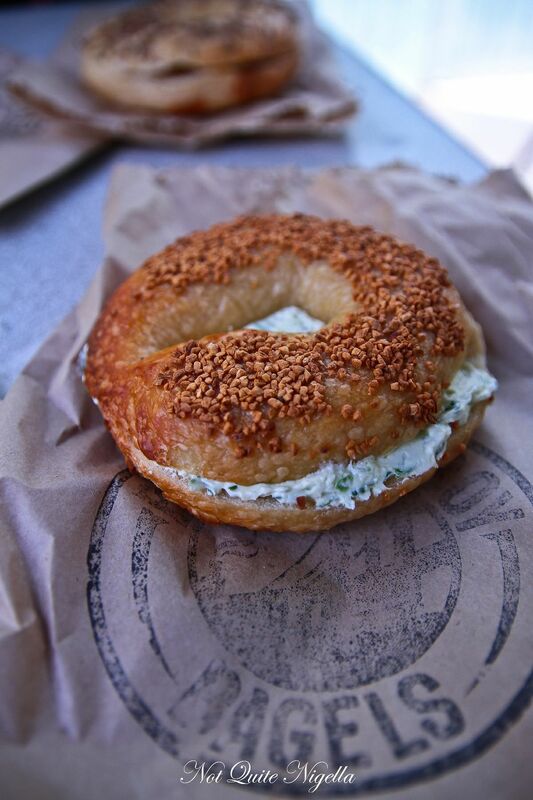 $7 buys you a bagel with a schmear which could be one of four types of cream cheese, Pepe Saya butter or Pepe Saya za'atar butter. The schmears also include jams by Hank's Jams and there's also Tasmanian smoked salmon or lox available for $4 extra. I asked Michael about when he originally conceived the idea. 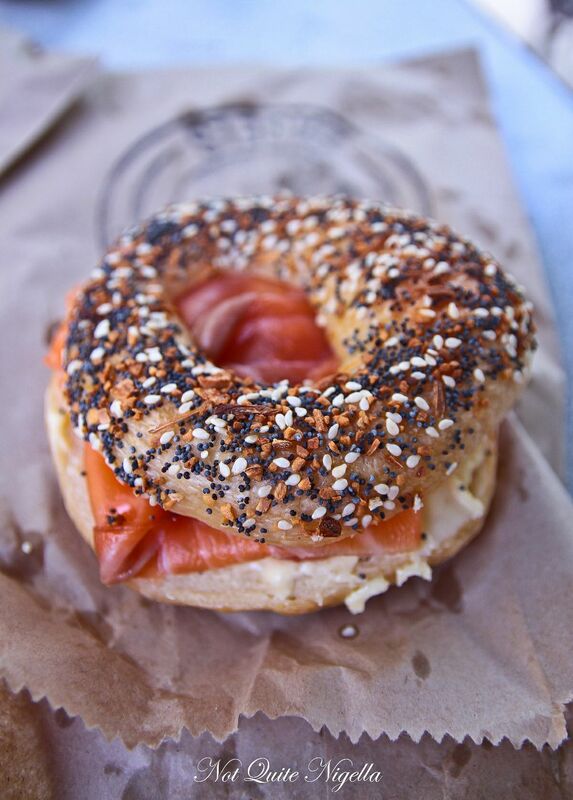 "I moved from the NY metro area to Sydney in early 2001, and Ive been talking about the inability of finding decent bagels in Sydney and Melbourne ever since. 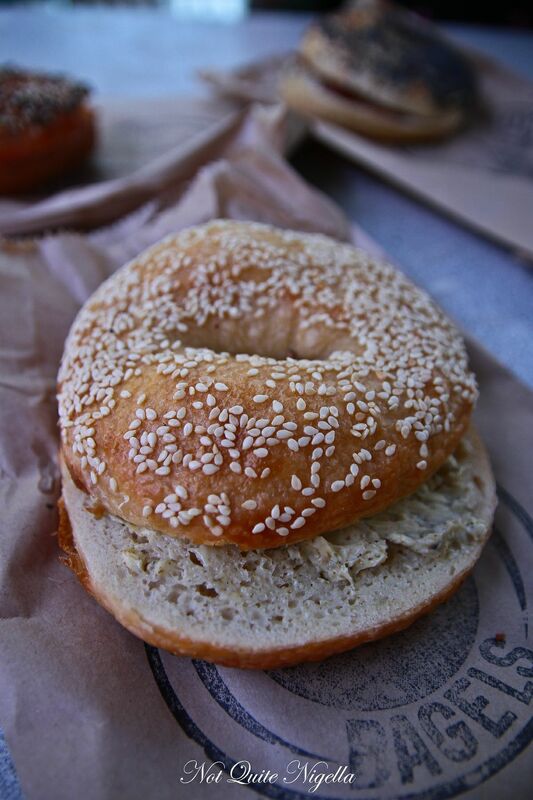 To this day, people still tell me that I need to try another bagel place to find the real thing, and so Ill travel out to check it out, and every time Im disappointed. The bagels here are too fluffy, too bready and never with enough flavour. Its what I call round bread. And most bagel-makers here dont boil their bagels. Thats a deal-breaker in New York." 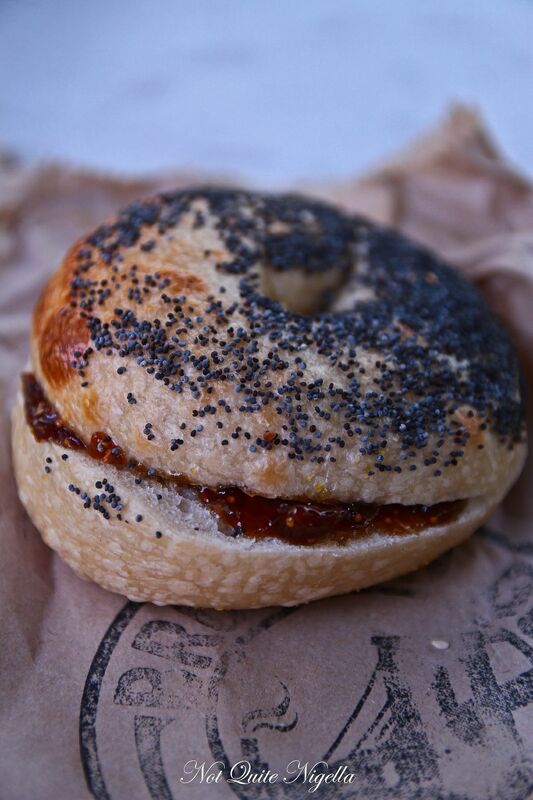 He learned about the art of bagel making while in the San Francisco Bay area and via email to bagel makers in New York. He spent time at Schmendricks in the Mission and with Dan Graf at Baron's Bagels who was so generous that he gave him his bagel recipe outright. 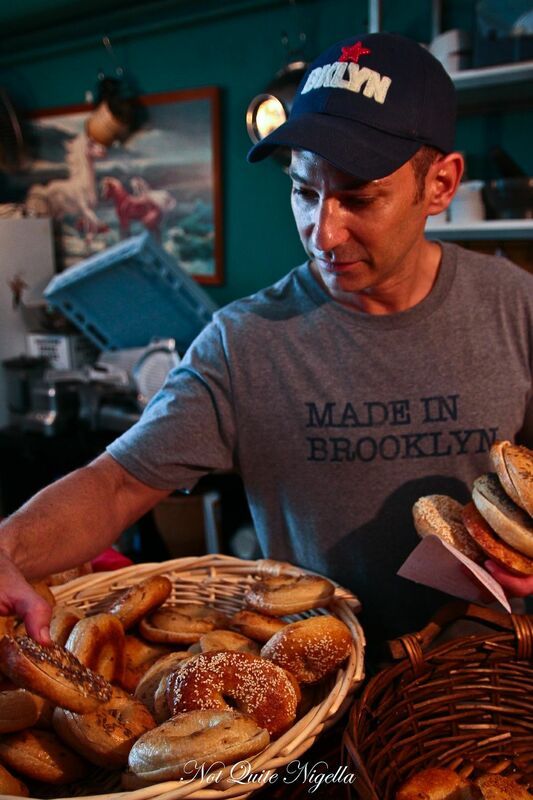 Family business connections with the esteemed Murray's Bagels means that he contacts Murray's son Adam by email to problem shoot bagel baking issues. Several months of serious testing ensued and there were not so successful experiments with lye where he and his scientist friend risked burns, toxic fumes and potential blindness to try and master the bagel. This ended with cautious mouthfuls of bagels where his friend felt a "tingling" on his first bite. " I pretty much had a panic attack right there, and though I might have to go to the hospital, all in the name of making bagels. And if I died from making bagels, how lame of an epitaph would that be?" he muses. The queue is long and moves slowly. The launch and hype surrounding it ensures that and once you get in, there is still queuing to do. Inside Darlie Laundromatic, there's an intriguing collection of skeletonised record covers looking down onto the eat in area. After one and a half hours, we reach the front of the queue and we pay at the coffee machine where they make American drip filter coffee and serve A&W root beer and other American sodas. 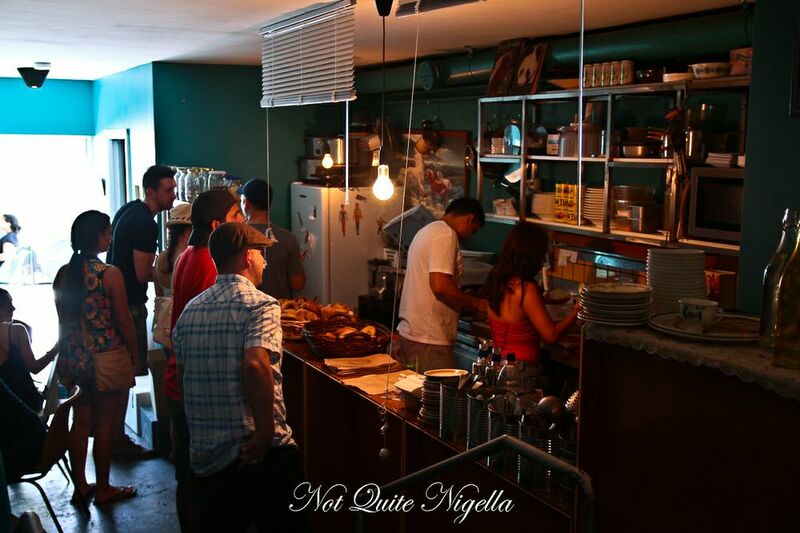 We watch as Michael and his staff make up the bagels to order. Because of the number of schmears and bagel types (plain, sesame, poppyseed, garlic, onion, caraway and 'everything'), there's no pre schmearing done and that is part of the reason for the slow moving queue. The plain and everything bagel with all the toppings is sold out although Michael unearths one right at the bottom of a basket when looking around for another bagel. Our bill for our bagels and drink comes to $39 which isn't inexpensive but we take our bagels and sit in the outdoor area. Ideally I would have loved plain cream cheese and lox on a sesame bagel but they were out of their plain whipped cream cheese. 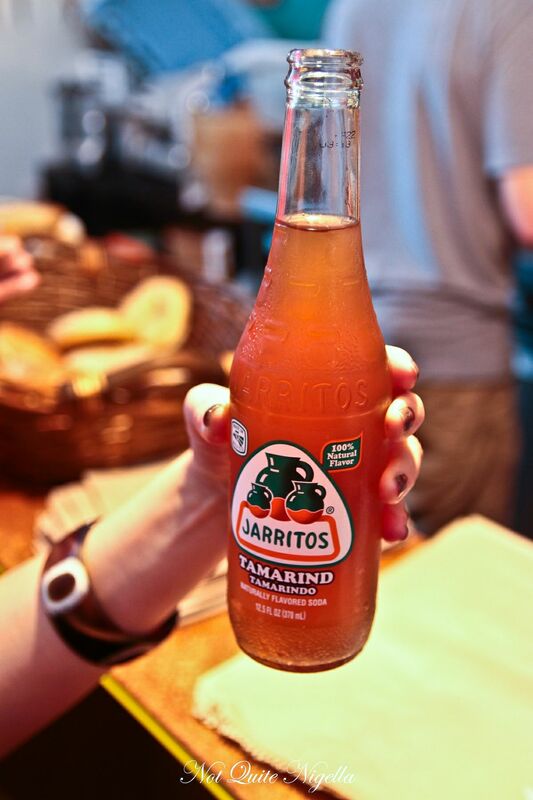 No matter, I have a bit of a combo of flavours. Sesame remained my favourite as always, the garlic bagel is strong and a warning: you will get garlic breath (you can probably see how much dried garlic is on top of a single bagel in the picture above!). 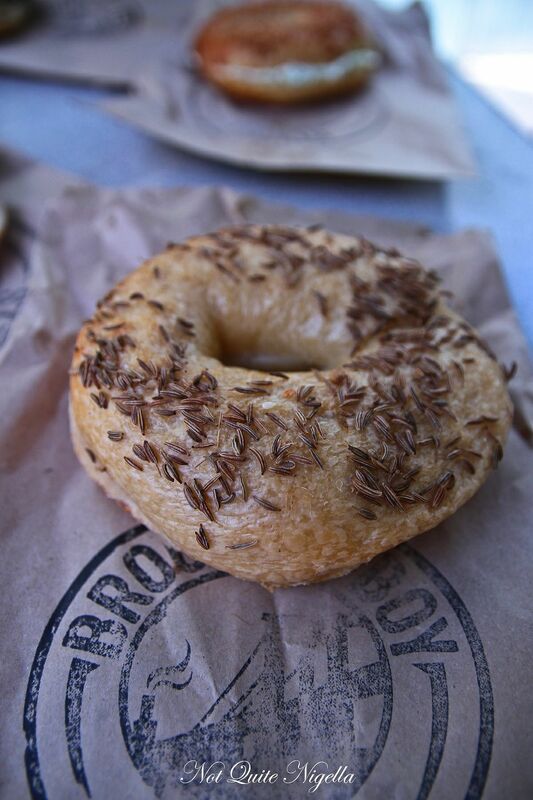 The everything bagel is also good for the undecided although having this many crunchy seeds does make the texture of the bagel more crunchy than chewy and the caraway is also delicious with that distinct caraway flavour. Poppyseed is another classic flavour that we both like. I find myself taking these home, freezing them and eating one every day savouring the chewy texture. After two hours, they sold out of their 350 or so bagels. Michael says later "It exceeded my wildest imagination. That said, the Jewish guilt really kicks in when you have to turn people away. Ive always been raised to make sure everyone has more food than they can handle. My Polish grandmother Anna would be turning in her grave." How likely it is that he will continue this pop up idea beyond the initial four Sundays? He says "Right now I know A) I love making bagels for people and B ) that the huge lines around the block at Darlie Laundromatic are a clear sign that Australians love real, properly made New York bagels. Ill take a few weeks to see what the numbers say, but my gut feeling is that this is going to become a regular business. In fact, I just hired my first baking assistant yesterday." And Michael's tip for the bagel of choice? "Im a purist, so I love the everything bagel with a simple schmear of plain cream cheese, which I whip at home to give it a nicer, softer texture. All you need is that, some orange juice and a read of the New York Times on your iPad, and you could practically be in Brooklyn right now." 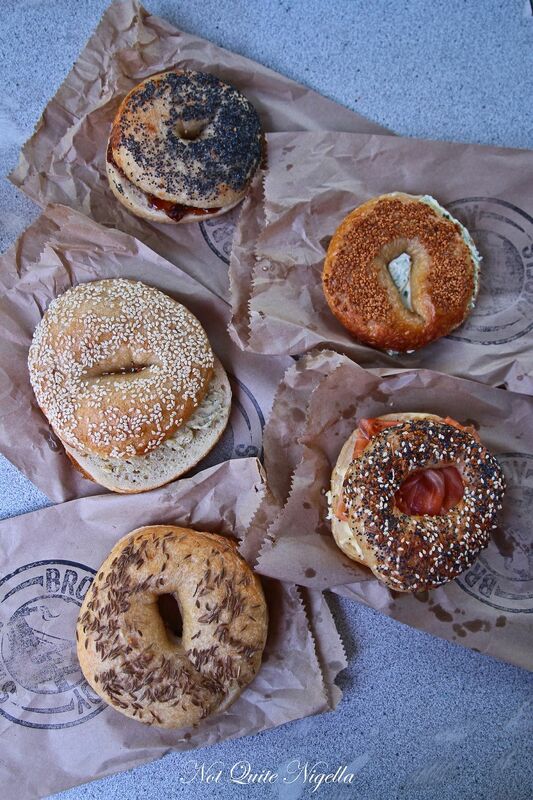 So tell me Dear Reader, do you like bagels and if so, how do you like your bagel and with what toppings? 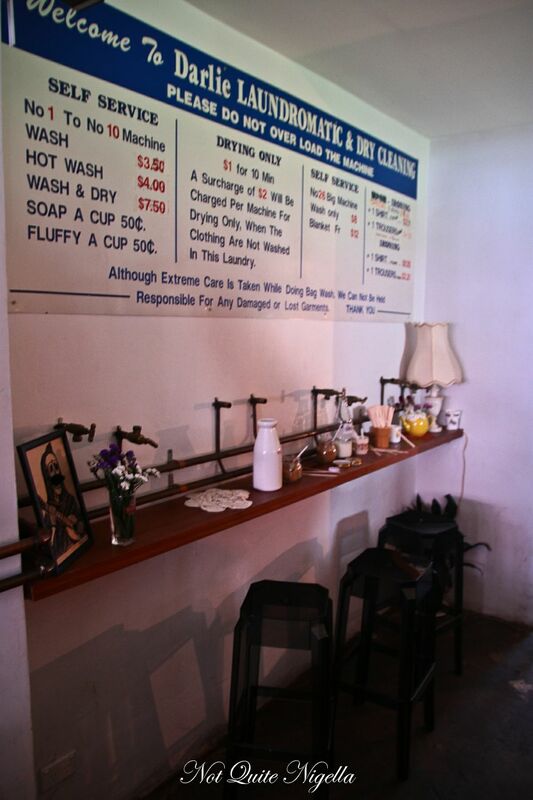 Open on the following Sundays: 17th February 2013, 24th February 2013, 3rd March 2013.